Jazz Hot is 80! Undoubtedly, a remarkable birthday for the oldest jazz review in the world, highlighted by an exhibition consacrated to the works of the jazz of of its founder, Charles Delaunay, Delaunay's Dilemma, welcomed to the Fond'Action Boris Vian by its director Nicole Bertolt. What better way to give hommage to Charles Delaunay, than to place oneself under the benevolent patronage of Bison Ravi (Boris Vian), his principal disciple of jazz in spirit and prestigious elder in art and writing? Equally, readers of Jazz Hot have had the opportunity to rediscover the beautiful front covers, punctuating the exhibition, that have lined the past 80 years and particularly the last 25: Duke, Ella, Basie, Von and Chico Freedman, Kenny Barron, John Coltrane, Randy Weston, etc., and of course...Boris Vian! The slide-show below gives the reader a view of this exhibition and the warm, friendly ambiance that presided during the exhibition opening right through to the closing party. We propose to give you a description of the event as well as a summary of the three round-table debates that we held over the fifteen days. You will also find, gathered together at the bottom of the page, the dedications of nearly two hundred and fifty musicians (and draftsmen /women of equal talent) who have shown their attachment to Jazz Hot on the occasion of its 80th birthday. Amongst those are Sonny Rollins, Wynton Marsalis, McCoy Tyner, Benny Golson, Dianne Reeves, Dee Dee Bridgewater, Toots Thielemans, Tchavolo Schmidt or the still lamented Phil Woods. 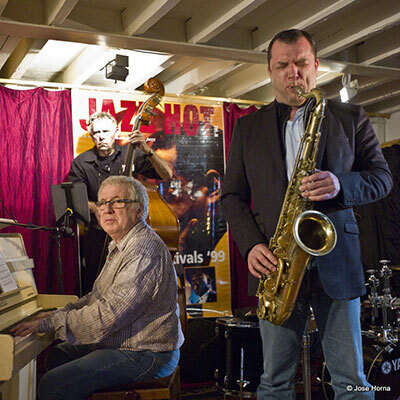 The day of the opening, 28th March, the Jazz Hot team prepared a very beautiful party. A complete success thanks to the continued participation throughout the day and evening (from 2pm until midnight) by those invited by Jazz Hot, many came (around 300) to discover the exhibition and blow out the eighty candles. Amongst whom, we had the greatest pleasure to welcome historic jazzmen such as Hal Singer (who is 15yrs the elder of Jazz Hot...), Claude Bolling, Roger Paraboschi, Jean-Louis Chautemps, Bobby Few, Poumy Arnaud, and equally Mathias Rüegg, Lia Pale, Michel Pastre, Esaie Cid, José Fallot, Laurent Mignard, Mra Oma, Ichiro Onoe, Dan Vernhettes, etc. ; some «elders» of Jazz Hot like André Clergeat and Alain Tercinet; the president of Hot Club of France, François Desbrosses; professional record dealers and producers: Daniel Richard, historical record dealer and outstanding producer , Arnaud Boubet et Maxime, the indispensable friends from Paris Jazz Corner, a Parisian record shop of importance, Jeanne de Mirbeck (sister of René Urtreger), and others, known or lesser known, from the world of jazz; finally, the long time readers and friends like Micheline Davis-Boyer (la fille de Daidy Davis-Boyer, la «fiancée de Jazz Hot», voir notre n°600), Clovis Salvador, the nephew of Henri, the painter Pierre Clama not to mention Rolande Gourley (the wife of big Jimmy Gourley). The total success was also down to the musicians who came to animate the birthday-jam. First we salute the two pillars of this 12 hour muscular marathon: our writers-musicians Gérard Naulet (p) and Daniel Chauvet (b) who kicked off a duet of «There Will Never Be Another You», notably followed by beautiful variations of «Take The 'A' Train» and evidently a few Cuban notes on percussion, dear to our friend Gérard. Our backbone of swing were next joined by Michel Pastre (ts) and his big sound in the tradition of «Satin Doll». Philippe Desachy, a baritone sax, joined for a few numbers, one of which was «Song for My Father». Another rhythm section took the relay, it was composed of David Herridge (p) and Jean Claude Bénéteau (b), accompanied by a brass quartet: «our» Michel Laplace (tp), EsaÏe Cid (as) and as always, Philippe Desachy and Michel Pastre on «Perdido». A game of musical chairs reinstalled Gérard Naulet on piano, with Claude Dupont (b) and David Georgelet (dm), flanked by the same sax trio who took away the «C Jam Blues». After which Yves Nahon took up the drum sticks and Jean -Yves Dubanton his guitar to accompany the day's first singer, a Swede, Ellen Birath who delivered «On the Sunny Side of the Street» full of charm in her dialogue with Michel Pastre. Another Swede, Isabella Lundgren (voc) also sang, completely unknown in France, however, Jazz Hot had made a note of her in the 2013 festival edition featuring the Ystad festival, just one of the discoveries, with Lia Pale, that counts for a lot, in this birthday party. The group, rejoined by Jean-Claude Laudat (acc), next Gilles Le Taxin (b) had thus ended the afternoon, only to embark, for a first «warm-up», Boney Fields (tp) in a quartet with Gérard Naulet, Daniel Chauvet and Yves Nahon on «Well You Needn't». At 6pm, the music was interupted by a few speeches for the occasion from the director of our review, this was the moment to present the exhibition, to thank the different partners (Fond'Action Boris Vian, Caveau de La Huchette, Paris Jazz Corner, Déja production, Spirit of Jazz, Copytoo, La Manufacture d'Histoires Deux-Ponts, Jona Dunstheimer and his team for the sound, Jazz Station in Brussels, Toucy Jazz Festival) and to remember Cabu, equally one of our own, who was tragically assasinated early January 2015, who's loved ones were present. To open the exhibition gallery, Nicole Bertolt remembered her long engagement with the Vian family and of Ursula, Boris' second wife. We next paid honnor to the two patrons of this birthday: «our» photographer David Sinclair (to which a part of the exhibition is designated to his splendid photographs), represented by his son Malcom who came over from England for the occasion, and our writer Serge Baudot, poet in his own time, who evoked his «entry into jazz», Jaques Prévert (Boris' neighbour on the terrassed roof of the Moulin Rouge) and the elder Vian in one of his famous press reviews. Next the music reclaimed its rights, with a Viennese duo to open the ball, composed by the beautiful and talented Lia Pale (voc) and Mathias Rüegg (p), a great arranger and knowledgeable pianist and creator of The Vienna Art Orchestra. These two artistes came especially from Austria for this birthday, having prepared a fine programme taken from the singer's latest album, My Poet's Love. 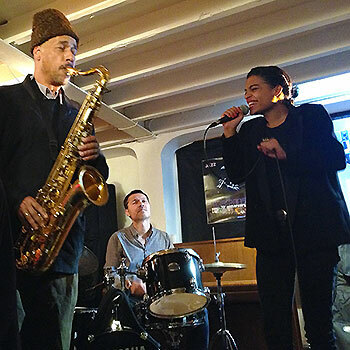 After which Lenny Popkin (ts) inaugurated the vespertine jam-session, accompanied by Carol Tristano (dm), Dominique Lemerle (b) and the young and gifted Dexter Goldberg (p). Boney Fields and his accomplice Breno Brown (ts) surged onto the stage imposing vigerous solos of «Night in Tunisia». Having returned to the jam, Isabella Lundgren found herself an interlocuteur of choice with «our» Adrien Varachaud (ss), whereas later on Michel Pastre retook the service in her company and that of Lenny Popkin. Michel Pastre equally made up a trio with Daniel Chauvet and Philippe Milanta (p) for a savoury «Just You, Just Me». An intense moment of the evening, the arrival of Ricky Ford (ts) and an entourage of Kirk Lightsey (p), Jack Gregg (b) and Simon Shuffle Boyer (dm). An all-stars that did not put off the sparkling Agathe Iracema (voc) who expressed herself with «On the Sunny Side of the Street» (again). 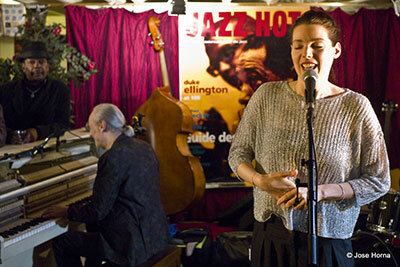 She then formed a pretty duo with Isabella Lundgren with «Everyday I Have the Blues», in the presence of Larry Browne (tp, voc), omnipresent animator of the evening. Agathe even completed the rhythm section with herself on the drums to accompany Isabella on the next section of the piece. To follow, Laurent Epstein (p) and Dominique Lemerle brought elegant support to Christelle Pereira (voc). Whereas the untiring Gérard Naulet gave us an Afro-Cuban piano solo! The end of the evening was made beautiful with trumpets booming an evocation of New Orleans served by Larry Browne and Jona Dunstheimer (who also assured the sound for the event with the attentive Jérémy and Jonathan). Finally, the impressive Joan Minor (voc) closed this beautiful day with a magnificent «Summertime» with a very subtle contre-chant from Esaie Cid (as), who illuminated the whole evening with his beautifully lyrical punctuations, and the resistant Gérard Naulet, capable of adapting himself to all situations. It is therefore, with eyes full of stars and blue notes full in the heart that all the revellers left this beautiful communion around an ancient review, always capable to reunite, 80 yers later, all the families and generations of musicians, jazz lovers, this great music of sharing. 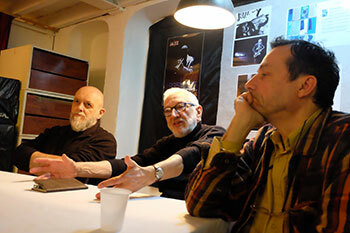 The day after the inauguration party, 29 March, saw the first of three round-tables that punctuated the duration of the exhibition, titled «The record and jazz' memory», hosted by Yves Sportis and Mathieu Perez. The two principal speakers at this debate were Daniel Richard, previously a record dealer and producer (he noteably managed Universal Jazz) and Arnaud Boubet, record dealer and founder of Paris Jazz Corner. First of all, Daniel Richard spoke of his experience as a producer, particularly the production of reissues which, as far as he is concerned, were more satisfying than new work; the system of levelling at the major record companies by lowering artistic projects. Conversely, the exploitation of historical recordings permitted him greater freedom, even if the worry of marketing remained dominant (and with success: the collection Jazz in Paris sold over 3 million CDs world wide). Understood, the big corporations exploited the patrimony on the basis of financial returns and not of conservation or transmission. Daniel Richard found it regrettable that record companies weren't concerned about archiving the documents produced in association with the recording sessions, which constitutes to the loss of memory. 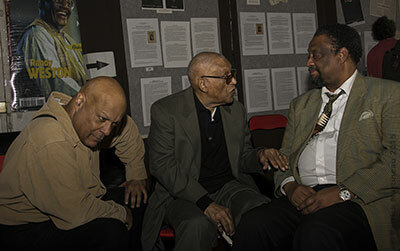 He also added that when he started working on the reissues, in the 1970's, the history of jazz was of no interest. The major companies edited the compilations for the «general public» so it was difficult for the jazz lover to have a complete collection of reissues at their disposal. With the arrival of FNAC and its low prices, Daniel Richard saw the disappearance of the independant record dealers. The disc became a «cultural product» destined to consumers following «fashionable» prescriptions from the press. As an independant record dealer at the time, Daniel Richard maintained a strong position, sure of the confident relation he had with his clients and because he proposed imports that would never be found in FNAC. Another rmemory from the early 1990's, was the creation of the legal notion of «the public domaine» that opened the way to the free reissue of recordings from 50 yrs ago (in parallel, the support for the compact disc was booming). Seizing the oportunity, Daniel Richard met Noël Harvé, Christain Bonnet (the creators of the Masters of Jazz collection, particularly appreciated for the quality of their sleeve notes), Giles Pétard (who reactively responded with his tremendous work, reissuing the most importants Classics but with more succinct sleeve notes), as well as Claude Carrière. The collections built up by Gilles Pétard always carry an authority. It was constructed with private collections and had geat success with jazz lovers the world over. Daniel Richard estimates that these days, reissues of collections of complete works are no longer made (other than those made by Patrick Frémeaux) due to the collapse of CD sales and the extension of copy right to seventy years. Even though the heritage collections are available through streaming platforms, these do not –up until now– deliver any information on discography (despite the fact that the technology exists) and badly remunerate the authors who created these collections. Arnaud Boubet took part to share his fear of seeing the memory of current and future jazz disappear with the abandonment of physical support. We equally underlined that the independant record shop (or store) is a privileged place where exchanges pass between jazz fans, therefore adding to its transmission and knowledge. Daniel Richard evoked the idea of creating a centre of documentation, in Paris, dedicated to jazz, which will justly be a place to meet and communicate knowledge. The other issue will be the conservation of private collections, as collectors are ageing and don't necessarily have inheritors who are interested in jazz – from here complete collections risk being broken up. Daniel Richard thus evoking his own case, with a collection that consists of not only discs but also several tonnes of paper documentation: reviews, catalogues, discographies, photos, etc. Contrairy to American examples, French universities do not expect to take on the work of numbering the archives from private collectors. However, Arnaud Boubet objected that an accessible numerated on-line back-up would not be sufficient as, equally, it is necessary to conserve objects and physical supports, insisting on the necessary museum vocation for a centre of documentation for jazz. The risk of shutting documentation away has equally been evoked through the example of the Delaunay assets at the BNF(French National Library). Arnaud Boubet has, in short, indicated that a resource centre would be a very useful tool for those that have re-edition projects. Yves Sportis proposed to undertake a concret and collective approach, reuniting the principal representatives of jazz in France, with a view to creating a foundation. Mathieu Perez next showed an example of the House of Jazz in Liège (Jazz Hot n° 666). Our Belgian correspondant, Jean-Marie Hacquier, a fine connaisseur on the question of the memory of jazz in Belgium (he participated in the creation of Jazz Station in Brussels) then rejoined the table. The dispertion of private collections is a problem that equally presents itself in the Flat Lands (and is dealt with independantly in Wallonia and Flanders). Jean -Marie Hacquier, evoking different situations such as Léon Dierckx (Jazz hot n° 636) at the head of a collection of 200 000 discs and Robert Pernet of which the collection is conserved in the Museum of Musical Instruments in Brussels, but is not accessible to the public. From the cohesion of an impassioned debate, that had animated invited speakers and public alike, the outcome is for the necessity – the urgence, even,- to lay the basis of a foundation dedicated to the conservation of the memory of jazz in France, disposing, in Paris, the means to gather private collections, to organise their archiving and diffusion to avoid illegal securement of knowledge or the scattering of memory. Such a project necessitates large funds and investment (adaptation of a space, etc. ), but also its functions (to ensure perpetuity), and only an influential association-foundation (as representatives of jazz actors in France) would have the capacity to convince private and pubic financiers. 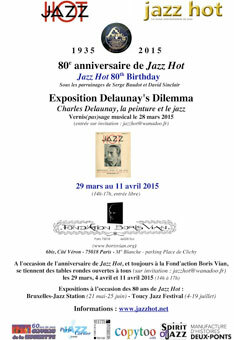 The second meeting proposed by Jazz Hot, 4th April, was consecrated to one of the major figures in its history, Boris Vian, in some ways host to this exhibition, who collaborated with the review from 1945 until his death in 1959, therefore maintaining a great loyalty and friendship with the review of his friend, Charles Delaunay. Yves Sportis, who lead the debates, first gave a reminder that jazz formed the personality of Boris Vian, who treated the subject with great seriousness under his humerous exterior and with an occasional badness which entered into coherence with his acute understanding of this music. Boris Vian presents himself, in fact, as the disciple of Charles Delaunay in his manner of embracing jazz in its entirety, from the origins of its modern forms; the two men thought of jazz to be like a moving art, (thus differentiating from the very «ethnic» vision of Hughes Panassié or that of the relentlessly progressive André Hodier) and sharing an international vision of jazz as well as a taste for America. The relationship Vian-Delaunay was reserved with reciprocal admiration. In addition, the famous press review of Boris Vian, that amused jazz fans so much, constituted a serious work, entrusted by Delaunay who sent him reviews to comment on (foreign reviews were difficult to find in France). The exercise was, in addition, an original synthesis of the activities of a journalist, crtic and writer. In this sense, Boris Vian had been a pillar of Jazz Hot and had written one of its most notable pages in its history. What he considered to be a «little collaboration» was in fact fundamental for our review and for criticism in general, notably by the independant tone in which it was printed. 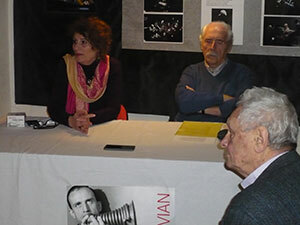 An older editorial member of Jazz Hot, Alain Tercinet was invited to evoke the memory of Bison Ravi along side the director of the Fond'Action Boris Vian, Nicole Bertold. They are united by a long collaboration around Boris Vian, notably the writer's record collection conserved in his flat, three floors up (visits by appointment) in the Cité Véron. First of all, Alain Tercinet evoked his difficulty in defining the rapport between Boris Vian and Charles Delaunay: because if he knew the second well, he confided little. Alain Tercinet joined Jazz Hot at the end of the sixties as a layout designer, until one day Delaunay held out a record asking him «Would you like to do a critique?» (everyone, except Boris Vian, addressed Delaunay with the impersonal vous). Alain Tercinet had insisted on «the nerve» that had supported Delaunay by entrusting a regular comumn to Vian; this news review that also had reader's letters (giving a place to memorable disputes with certain readers) and also a long distance dialogue with Hughes Panassié, kindly titled the «pope», but respected. Quoting Vian himself, Alain Tercinet remembered the assuming subjective character of the press reviews. He then turned to focus on the opposition of Vian-Panassié who, according to him, picked up on the advantage of the opposing personalities (Vian never appreciated that Panassié attempts to oust Delaunay after the war) more than on opposing styles. This did not prevent Boris Vian from expressing his estime for Hugues, the «pope», whom he ridiculed. 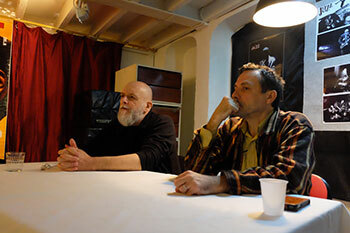 Alain Tercinet added a tasty morsel from a concert in Lyon: that of Dizzy Gillespie's quintet. The «panasséists» (they had bought their seats) had come with whistles and, unbeknownst to them, were encircled by the members of the Hot Club of Lyon, crouching low between the rows to confiscate their whistles. A concert that was concluded with a very Gillespien pleasantry that was presented thus: «On the trumpet, Louis Armstrong!», sparking off shouting from the panasséists and laughter! Present in the hall during this concert, Jean -Louis Chautemps, told that he regularly saw Boris Vian in the Club Saint-Germain (in the years 1948-1949), but the young musician (he played the trumpet at the time) was intimidated by his «celebrity» status. Nicole Bertold had explained that it is Jacques Canetti who took Boris Vian into record production, Charles Delaunay being a stranger in the affaire. In effect, seduced by the personality of Boris Vian and his vast knowledge of jazz, Jacques Canetti suggested to him that he be his collaborator at the heart of Philips (Boris Vian ended up being artistic director of this record label). While touching on the question why Boris Vian never went to the United States (the question is equally evoked in «Boris Vian. Le Voyage en Amerique», Jazz Hot n°671), we ask ourselves if, with a strong anti-racist conscience that was advanced for the time, he would not have preferred to be contented with a dreamed America rather than to be confronted with the reality of segregation. To which Nicole Bertold replied that his heart trouble prevented him from all air travel but that if, on leaving l'Ecole Centrale, he had no wish to follow his friends leaving for the New World (he already had a young family), since his relationship with Ursula, he fantasised about the possibility of going to New York. Other themes or questions still remained to explore and clarify the relationship between Boris and Jazz Hot. But already happy to have shared numerous wonderful anecdotes, the participants concluded the discussion by raising a glass to the memory of the elder. The third and last round-table, following on from the first where it was the question of the memory of jazz, is consacrated to «the musician's narrative». Free speech was given to the musicians present, starting with the day's «guest of honour», Chico Freeman, who came specially from Switzerland for Jazz Hot's birthday. The saxophonist gave a public interview with Yves Sportis, here he told how he came to jazz by watching his father (Von Freeman) practicing at a time (begining of the fifties) when Chicago had a richer jazz scene than that of New York (by Chico's words: Chicago was «the south in the north» by means of movement of Afro-American populations come from the south towards Chicago and not towards New York, notably carrying the culture of the blues). There where he lived, the kids, in summer, would come onto the porch to listen to his father repeat with other musicians. Chico told that its not due to the education from his father that he was able to explore jazz (he only owned five records!) but due to a school friend's father that was a collector. Nevertheless, one of the five records owned by his father gave him the desire to become a musician: Kind of Blue by Miles Davis. With a sense of humour, Chico spoke of his beginings in Chicago, of his jazz scene and blues. A particularly funny moment was when Chico reminisced about his arrival in New York (he played then with Elvin Jones) without a cent, and where another great drummer took him under his wing, this was a certain...John Betsch. Saying that, he hadn't remarked that John Betsch was also just behind him! These reunions were truly improvised. Next to speak, another son of a jazz man, Sean Gourley (worthy inheriter of Jimmy). Contrary to Chico, Sean, with a French mother, was born and raised in Paris, where he entered the conservatoire at 6 years old. He hadn't the street apprenticeship or the school friends that Chico spoke of, but his father made him listen to jazz guitarists, notably George Benson. As soon as he could, Sean abandoned the conservatoire and started to play rock in the basements with another son of a musician, Philippe Urtreger (this is who provoked the conficts between father and son). Later, Sean came to jazz where he finally found the energy that he was looking for in rock. Another testimony, that of Luigi Grasso, originally from a small village near Naples, where there was no jazz scene. The discovery of jazz, through his parent's jazz records, allowed him to express himself more freely on the saxophone that he studied from the age of five. After these reminiscences, Jean-Louis Chautemps let out a cry from the heart, calling to speak of the future! To which Jacques Schneck replied that beyond stylistic evolutions, these are the qualities of popular music, favouring chance meetings, that jazz must conserve. Communication with the public and emotion being more important than knowledgeable research. However, the musicians find themselves encouraged by their culture and the publications that specialise towards experimentation. David Herridge explained that at the end of the sixties, the London scene was closed to traditional jazz, only favouring the avant-garde which imposed itself in an aggressive manner. He has, in addition, regretted the compartmentalisation between styles, remembering a conversation that he had with Georges Arvanitas regarding very compartmentalised schools: Bill Evans, boogie woogie, etc. Katy Roberts replied to this, that the present situation had at least the advantage to make room for women in Jazz. During the seventies at Berkley she was the only girl in the class, while today, as a teacher, she remarks that the students are mixed. The essential problem that presents itself, as underlined by Jacques Schneck, is that of the public. Because if the jazz scene is very vibrant – perhaps, as it has never been -, one ascertains a crisis in communicating with the public. Yves Sportis was remindful that jazz has a dimension of being both popular (in the United States, it was a part of daily life) and artistic (demanding aesthetics of great musicians: Armstrong, Ellington, etc.). In fact, American musicians came to Paris to gain recognition for jazz as an art (like the painters, or writers before them). Without this course of action on their part, jazz in France would be limited to entertainment music. The artistic demands of musicians still exists but the public has deserted. It is therefore necessary that the different components of jazz mobilise to revitalise a popular jazz culture, with artistique demands, this is happening, notably, with the re-establishment of links with American roots. Follwing on, with vigour, Mra Oma regretted that it is difficult for American musicians to play in Paris, the European scene being, on the whole, partitionned between French jazz, Spanish jazz, German jazz, etc. This, when the American musicians who have brought jazz to Europe, did so with great generosity. Chico Freeman underlined that if we cannot predict the future of jazz, the enclosure within catagories is not just from yesterday. He quoted Charlie Parker: «The musicians do not control the business. They always control the music». Chico estimating that this is no longer true, that the musicians no longer control the music. Now, what counts, by his meaning, is that the musicians continue to make music and people come to see them. But, the arrival of the internet, which is a sort of Far-West, poses new problems. Hal Singer's majestic arrival to the reunion, where he was visibly the «king», created a small event; he remembered that in his youth he wasn't conscious of the music's business dimension. And he was a part of the same musicians from the big bands of Ellington, Basie or Lunceford. It was for others to bring back the money. In addition, he explained that in the past, one immediately recognised each musician by their sound, and that today, even if he is delighted by the quality of the education given to musicians and their level of technique, they all sound the same. And if previously the musicians played above all to communicate with the public, these days they appear to first of all seek to show themselves to an advantage amongst other musicians. The conclusion of these exchanges, sometimes enflamed, was very elegantly given after nearly four hours of exchanges by the same Hal Singer, «Où est le bar?» (Where's the bar?). The musicians took up their instruments for a jam-session to celebrate the closure of the exhibition. These were Sean Gourley (g, voc), Larry Browne (tp, voc) and Brahim Haiouani (b) who opened the proceedings, quickly rejoined by Katy Roberts (p). An occasion to give voice to the guitarist and the trumpetist, notably on «It Had to Be You». Next, David Herridge (p) joins the orchestra, along with John Betsch (a rather surprising reunion that worked beautifully!). The session was next taken over by singers with the arrival of Paddy Sherlock (without trombone) who threw himself into the blues, supported by Sean Gourley, Larry Browne, Katy Roberts, Brahim Haiouani (who practically never left the double bass all evening) and John Betsch: an original line up! 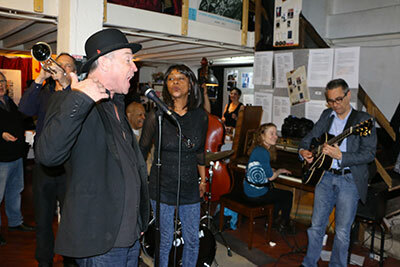 The blues continued with two voices in the company of Sylvia Howard. The intervention of Malaïka Lacy (voc) on «Somewhere Over the Rainbow», of which the powerful gospel expression had conquered those present, and literally staggered our friend Paddy. Another tasty duo were Farris Smith Jr. (b, voc, a discovery!) and Chico Freeman (ss). Joan Minor (voc) came along later to give proof to a beautiful expression. Finally, in the twilight of the party, Gerard Naulet (p), visibly back on form after the marathon exhibition opening, went straight into a swing duo with Brahim. Between the round-tables, the visits, every afternoon for fifteen days, came to confirm that in our country jazz still possesses solid roots, and even more so in Europe. There is a lot of curiosity about Jazz Hot and Charles Delaunay who remains an unkown monument to jazz in France, more so than abroad, despite a life dedicated to jazz and a body of work indispensable to the developement of jazz on an international level. 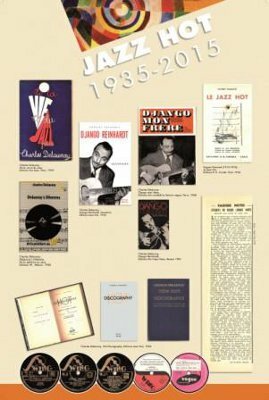 The fifteen days of the exhibition, the round-tables and the parties have therefore constituated a beautiful success by the yardstick of these 80 years that have made jazz history in France, at times on a shoe-string but always with original ideas and a conviction rooted in the love of jazz. Beyond our present team who contribute benevolently to this transmission, Jazz Hot and Charles Delaunay have essentially contributed to the artistic acknowledgment of jazz on an international scale from the 1930's, with and before any others in France and the rest of the world, whilst developing organisational tools necessary to jazz's independance, tools that today and since the begining of the sixties with businesses, often pretending to like jazz, institutions and government ministers, feigning left wing, and state sponsored cultural organisers have a tendance to destroy with an energy worthy of those who blow up the temples of Palmyra –just less blood. This exhibition and the debates have allowed some interesting exchanges, meetings, discoveries, reunions (like the visit from the friend Daoud-David Williams passing through Paris), in all, a certain state of mind, a rapport with jazz that creates the fact that we are Jazz Hot. A big thank you for these memorable fifteen days of many visitors, nearly a thousand, reader friends, musicians, jazz lovers, who gave us great pleasure with their participation in these exceptional moments, to the friends of Jazz Hot who came to lend the team a big hand to organise everything, Brigitte, Claudine, Olga, Gérard, Patrick, Marion, Alain, Kamel, Jona Dunstheimer and his team (sound).